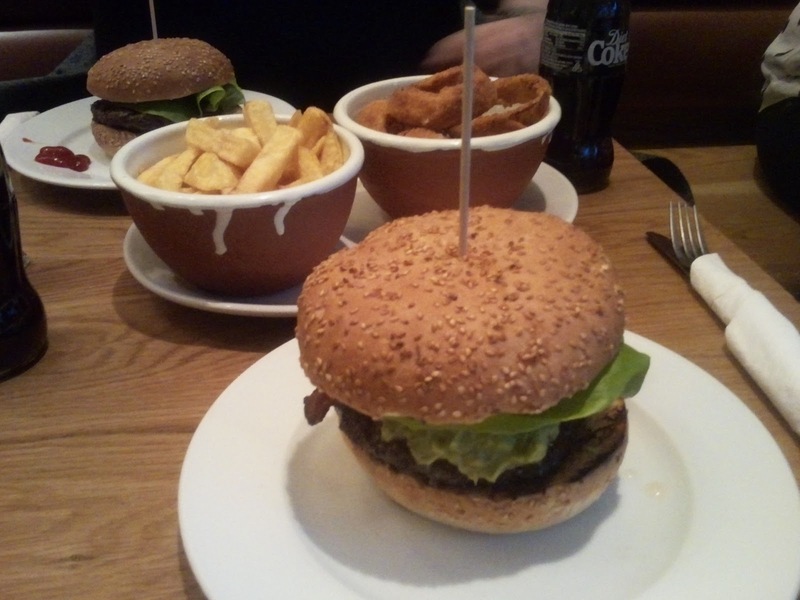 Location: Ahh, ubiquitous GBK, how we love you. An absolute staple restaurant for burger lovers, the Gourment Burger Kitchen situated by St. Paul's Cathedral is the backdrop for a good burger. Visited this New Zealand outpost with Anthony, for an executive lunch and as usual it didn't disappoint. My Avocado Bacon burger was presented 'bun-on' with a stick through the burger to hold it all together. Served on its own with no plate accompaniments, my burger seemed a little lonely. However a separate plate followed with a bowl of chips and a bowl of onion rings (@ £3 a bowl), which made the table appear less empty. Thumbs up! Although the bun looked a little generic, this was a soft yet firm sesame roll and was surprisingly hardy, allowing two-handed eating with no disintegration. A great aberdeen angus beef patty. Cooked medium-rare (as I'd ordered, and Anthony's was medium as ordered!) the beef was flavoursome and meaty. None. Although the bowl of chips, the chips were of a very poor, school canteen-like quality, but the onion rings were onion-y, crispy and really good. I haven't rated this down for not having bacon and cheese, however this didn't get top marks as the chips were £3 extra and terrible, and there was too much tomato salsa in the topping to work perfectly - however full marks for the quality of beef, and the choice of bun. A respectable 7/10 for GBK St Paul's. Honourable mention: As I was lunching with a friend, it would be remiss of me not to mention that his BBQ Burger had a fabulous bbq sauce that was a cut above your usual. If bbq is your thing, this is the burger for you at GBK.